I'm Matt Coulson, Executive Product Manager for Red Button in BBC TV and Mobile Platforms. Today we are launching the new BBC Connected Red Button on the Virgin TiVo service with plans to roll out the service to a range of connected TVs and operators in 2013. The service is presented in a feature rich yet powerfully simple experience that is suitable for just about anyone. Discover more shows from your favourite channel or station. 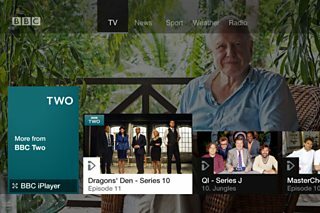 Enjoy programmes from channels even when they're off air: watch programmes from BBC Three, BBC Four, CBBC or CBeebies day or night. Catch programmes you missed with BBC iPlayer at the press of a button. Read or watch the latest news clips and stories that matter to you. Never miss the action from the sports you're passionate about including live events, highlights and headlines. Find out about the weather in your area. Yet while this is a significant milestone in the evolution of Red Button, it is only the beginning. The journey to Connected Red Button began in 2011 with a vision for the next generation of Red Button services underscored by a number of core product principles. The vision set out by Daniel Danker in his blog post was to reimagine Red Button for a new generation of connected TV audiences, retaining the simplicity, usability and range of content available in the original. We aimed to harness the latest in TV and internet technology to create a personalised user experience with rich curated content and to set a new standard of interaction on the big-screen - but most of all to make the result so effortless and natural that the technology becomes invisible and the content takes centre stage. While Connected Red Button is a long term strategic product, it in no way signals the demise of traditional BBC Red Button. Twenty million people a month press red on the BBC and our ambition is to develop the service and increase the size of our audience. Connected Red Button makes its debut on Virgin TiVo, an open platform that enables innovation through third party services. Virgin set-top boxes are connected to the internet, a requirement for the new Connected Red Button. Virgin TiVo subscribers were also, until now, unable to receive traditional BBC Red Button services so we're delighted to bring Connected Red Button to this audience. Throughout 2012 the BBC has also been engaging with a number of TV manufacturers and platform operators regarding our connected TV application plans and the related technical specifications and certification requirements. We'll be rolling out Connected Red Button to a range of connected TV devices during 2013 and in many cases 2012 TVs will also be upgraded to Connected Red Button. Over time, as audiences use televisions and set-top boxes which are increasingly connected we expect to migrate them from the traditional Red Button to the new Connected Red Button. With forecasts of up to 22 million connected TVs installed in UK homes by the end of 2016 Connected Red Button is well positioned as an enhanced Red Button service for users who already have or intend to buy supported connected televisions for their homes. There is lots of new content and features planned for the coming year including improved event support, more content from your favourite programmes and better personalisation. We also see a world where mobile and tablet editions team up with Connected Red Button on the big screen to deliver some truly immersive and versatile experiences. The Connected Red Button programme was managed as a series of agile delivery projects blending concept work, user centred interaction design, testing and audience trials with iterative software development. The product was engineered using BDD (behaviour-driven development) and TDD (test-driven development) encouraging close collaboration between product owners, testers, software engineers and designers. Crucially engineering teams worked shoulder-to-shoulder with editorial teams to jointly create an experience that blends technology and content in a brand new way for audiences, capitalising on the BBC's unique expertise in high quality curation. 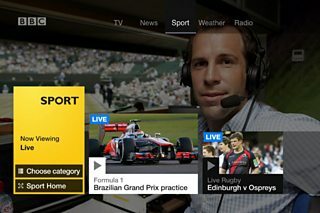 The service is a new and important addition to the BBC's Red Button portfolio. We hope you enjoy using the service and we look forward to receiving feedback over the coming days, weeks and months. Senior UX designer Robin Gibson has blogged about designing the Connected Red Button for TiVo while technical lead Duncan Fortescue has written a post outlining how they built the feature. Matt Coulson is the Executive Product Manager for Red Button in BBC TV and Mobile Platforms.